Cap: 5-20+cm in diameter, Grayish white to beige. Flesh somewhat thin. Stem: Off-center attachment to caps. White. 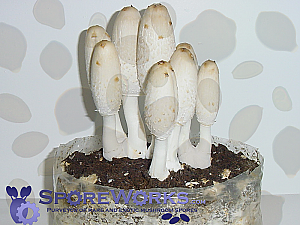 Spores: White to greyish, 7.5-11 by 3-4 micrometers, smooth and cylindrically shaped. Comments: Although a temperate species in the wild, strains have been selected for tolerance of high temperatures and high productivity. 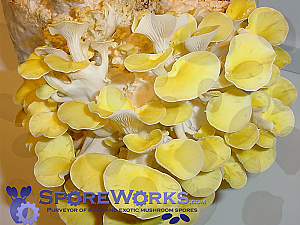 A proven fruiting strain isolated from this collection is available in culture form. * Spores intended for microscopy and taxonomy purposes only. Please check your local regulations.